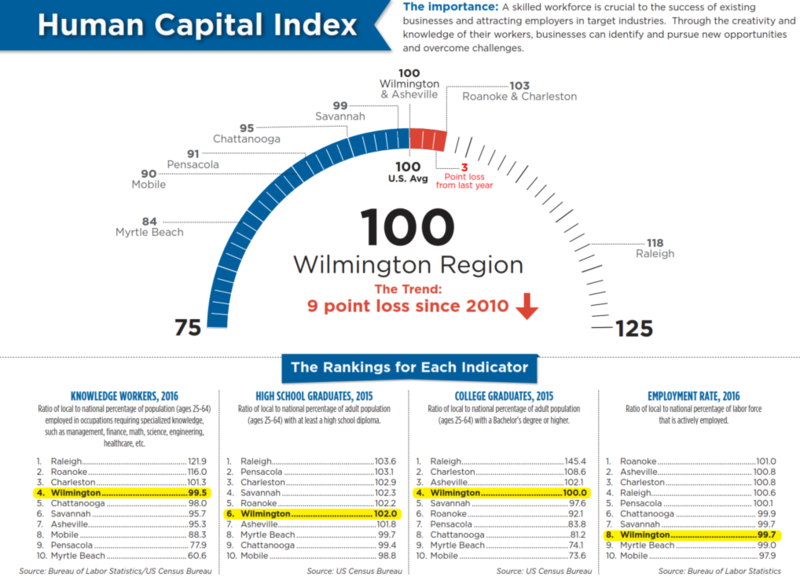 According to the latest annual Wilmington Regional Economic Scorecard, Wilmington underwent a loss of higher wage jobs but a growth in the service industries as well as an increase in quality of life. Adam Jones, professor of economics at the University of North Carolina Wilmington, states that this shift to a service industry and the loss of jobs in the tech and science sectors mirrors peer regions as well as the nation in general. 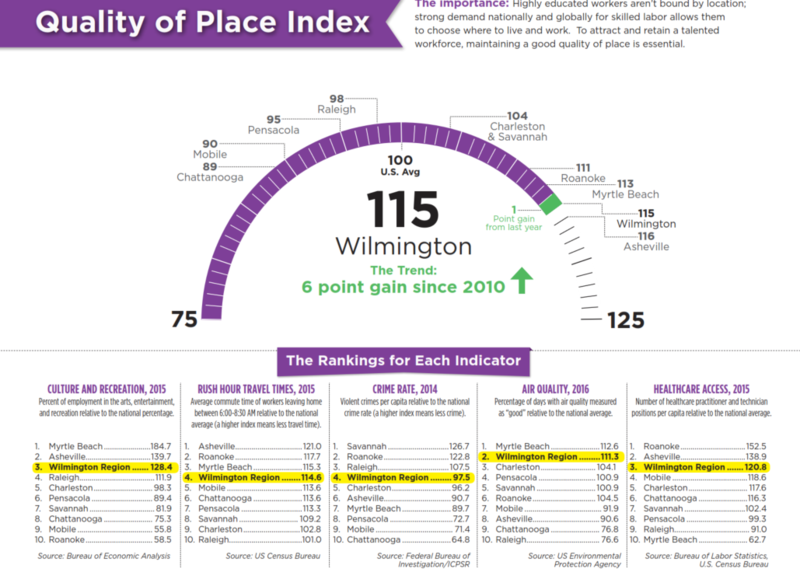 Wilmington's "peer" or comparable cities that were used in the study include Asheville, Myrtle Beach, South Carolina, Savannah, Georgia, Mobile, Alabama, Roanoke, Virginia, Chattanooga, Tennessee, and Pensacola, Florida. All those cities have similar demographics and populations to the Wilmington area. 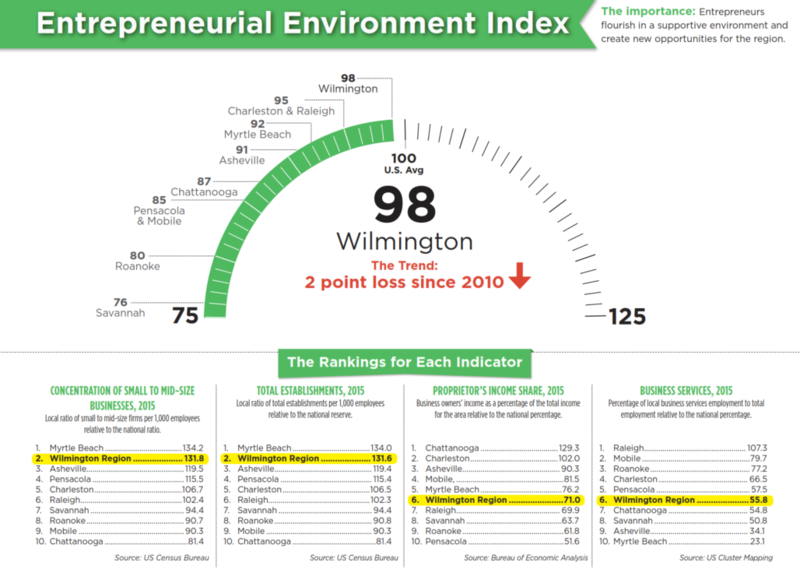 In most metrics, Wilmington scored above its competitors. A measurement of a skilled workforce which is crucial in attracting employers in coveted sectors. How supportive a region is in creating new opportunities for entrepreneurs. Where Wilmington really shines. A high quality of life attracts a skilled workforce. As an update, the attendees to the event were asked to give their opinions on the area's strengths and weaknesses in 3 areas of economic development: quality of place, traded sector and human capital. Large numbers represent what attendees see as strengths of the area. They were also asked their opinion as to the most important areas to focus on to improve Wilmington economic development.